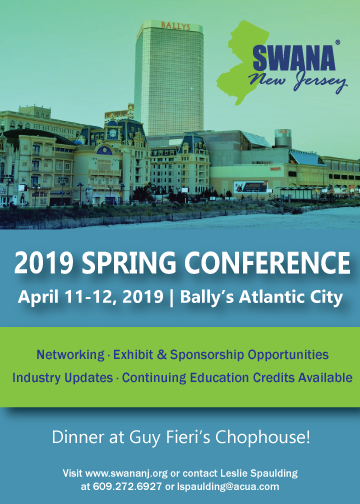 The SWANA NJ conference brings together leaders and organizations from across the solid waste and recycling industries for a two-day opportunity to share information, discuss current challenges and spur ideas for the future. Attendees will have the opportunity to meet with industry peers, exhibit a business or organization, and learn important updates on issues affecting the solid waste industry! This year’s conference will feature a delicious dinner at Guy Fieri’s Chophouse and a Cocktail Event for Young Professionals. Don’t forget to download our conference app – EventsXD- and search for SWANA NJ to have up to date conference information at your fingertips! All sponsor/exhibitor space has been filled. Thank you for your support! Rooms are available at Bally’s. View presentations from past conferences. Meet other solid waste professionals, stay updated on industry news, and take advantage of training opportunities. The NJ Chapter hosts several networking and training events throughout the year. Stay in-the-know! Represent the future of the solid waste industry: become a young professional member. Scholarships are available to SWANA members and family who are pursuing a college education. Does your organization have a sustainability project or program that stands out from the crowd? Showcase it by competing in the 3rd annual SWANA NJ Chapter Sustainability Award! The NJ Chapter of SWANA is a nonprofit educational organization whose mission is to advance the practice of environmentally and economically sound municipal solid waste management in North America.